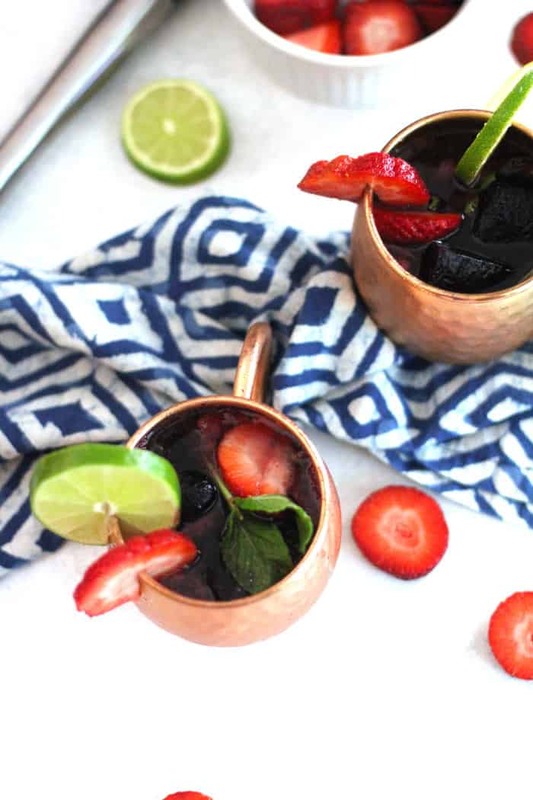 Strawberry Mexican Mules are a spin on the traditional mule recipe. Muddle some strawberries and mint, and substitute tequila for vodka. 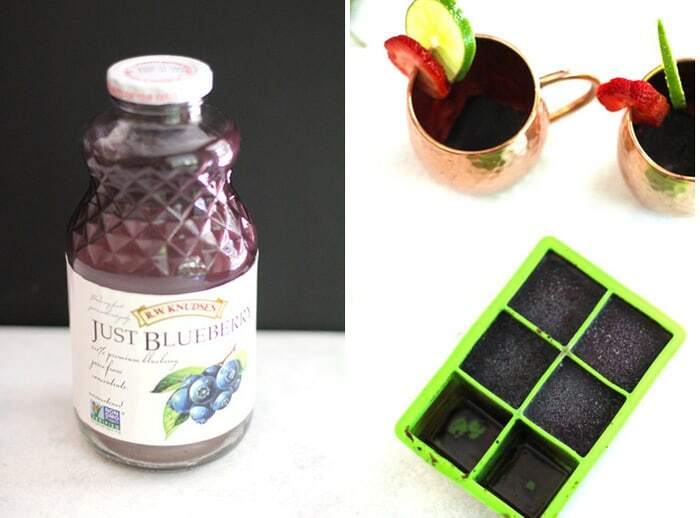 Use fruit flavored ice cubes for a sweeter cocktail! We have become mule connoisseurs as of late. Most drinking establishments serve them now, and there are so many interesting spins on this classic drink. We just returned from San Antonio for our youngest son’s college orientation (sigh), and we found ALL the hot spots while Zach was busy on campus. We had both a classic mule and a strawberry mint version, and loved both. 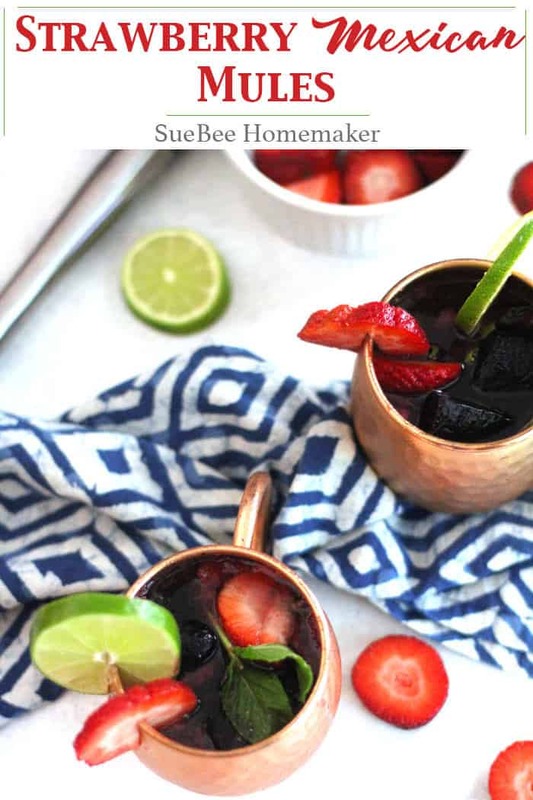 This Strawberry Mexican Mule was inspired via my sister, Shari. She texted me earlier this summer, after drinking one of these in a Cali bar, and said I MUST make them. So I did. Hot summer is in full force here in Texas, and so icy cocktails are our go-to on the weekends. 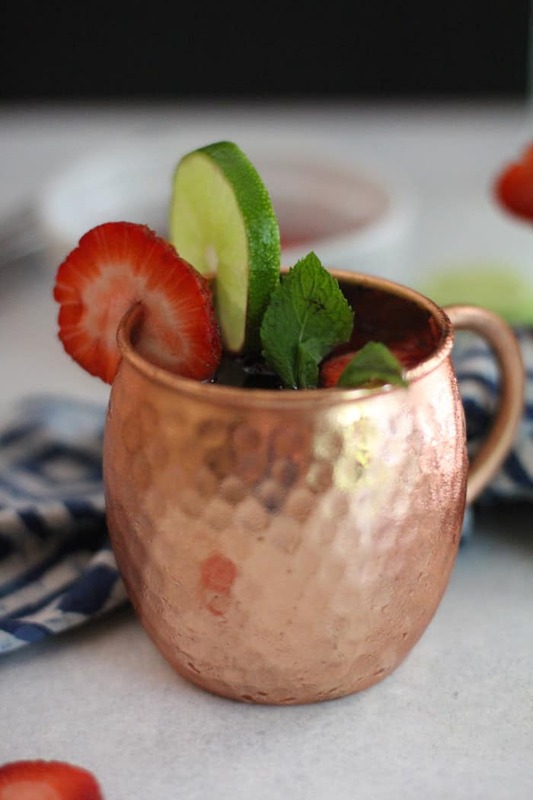 This is the third mule I’ve shared here, and summertime now spells M U L E S.
How to make a Strawberry Mexican Mule. (or a regular glass works too). Squeeze lime, and add the juice to mugs. Pour in (good quality) tequila and ginger beer. Stir. Decorate mugs with lime wedges and strawberry slices. Making fruit flavored ice cubes. They give the mules a nice fruity taste, and you won’t need simple syrup. The mules won’t be diluted by melting ice cubes (water). If you use clear glasses instead of copper mugs, you will see the beautiful color as well. There are SO many variations on mules, and I’ll be sharing more in the future. Stay cool this summer! (SEE BLOG POST) To make fruit flavored ice cubes, you will need an ice cube tray, and fruit juice. I used blueberry juice, and poured it into the trays the day before I served these. You can also use regular ice cubes, if preferred. You may need to add simple syrup if not using fruit flavored ice cubes. 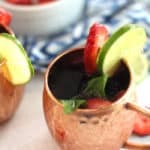 When ready to serve, take two copper mugs and place sliced strawberries and mint in bottom of mugs. Muddle slightly. Add fruit flavored ice cubes. Then add 2 oz. of tequila, 4 oz. of ginger beer, and 1 oz. of lime juice to each mug. Stir. 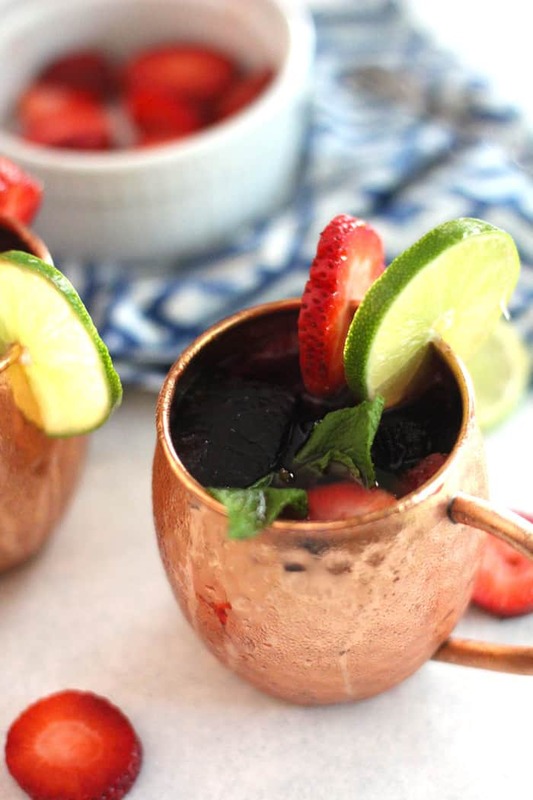 Decorate copper mugs with additional strawberry slices, lime wedges, and mint sprigs. Serve and enjoy! And you are welcome for the idea!!! So yummy and refreshing!! My favorite summer drink! So refreshing and light! Make sure you get the mug so you are an official Mule Drinker! I love all of your Mule recipes and it is fun to switch between tequila and vodka!